Tanks and ballistic missiles lumbered past thousands of spectators gathered in Kaliningrad on Saturday to mark the 70th anniversary of the Allied victory in Europe, an historic triumph for Russia that the Kremlin has used to whip up a new nationalist fervor. This Russian enclave was once the German province of East Prussia; the city’s Victory Square was known for centuries as Hansa Platz and briefly as Adolf Hitler Platz. On Saturday, when Russia and the former Soviet republics marked the anniversary of Hitler’s defeat in World War II, the square was awash in Russian and Soviet flags. Many people brought their children, whom soldiers encouraged to climb tanks and pose for photographs while wearing garrison caps and clutching tank-shaped balloons. Similar parades were held all over Russia, notably in Moscow, the capital, where more than 16,500 troops marched in Red Square. In the postwar settlement, East Prussia was incorporated into the Russian republic of the USSR, its entire population deported to Germany and the province repopulated with Soviet citizens, primarily ethnic Russians. Nearly flattened by British bombers and Soviet artillery, the East Prussian capital, Koenigsberg, was rebuilt as a drab Soviet city and renamed Kaliningrad, after Mikhail Kalinin, a Stalin functionary who held the largely ceremonial post of Soviet president during the war. 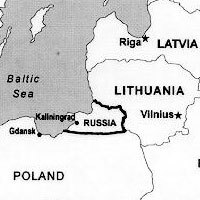 After the collapse of the Soviet Union in 1991, the Kaliningrad region found itself wedged between two EU and NATO countries-Poland and Lithuania. Locals benefit from the region’s geography; more than 70 percent of them, compared with 30 percent in Russia, have passports needed for foreign travel, and European visas are easy to get. They may not be Russia’s enemies, but they are alarmed by resurgent nationalism here and by the Kremlin’s naval base and two air bases in the region-especially after Russian President Vladimir Putin’s seizure of Crimea last year and Russia’s incursions into eastern Ukraine. “Ukraine is very close to Poland, so people have the right to be afraid. We are also afraid of exercises conducted by Russian troops,” said General Roman Polko, former head of Poland’s National Security Bureau. Nine thousand troops and dozens of warships were engaged in December’s drill, when Russia moved Iskander ballistic missiles into the Kaliningrad region. “In Poland, we are not protected from these kinds of weapons. For 10 years, instead of improving our capabilities, we’ve been focusing on faraway countries, like Afghanistan and Iraq,” Polko said. In January, the Russian army’s chief of staff, Valery Gerasimov, said the national priority for 2015 was to beef up the armed forces in the region, as well as in Crimea and the Arctic. The latest massive drill, held in March, engaged forces across the entire Russian northwest, including Kaliningrad. Solomon Ginzburg, a local democratic opposition leader who sits on the foreign affairs and security committee in the regional parliament, dismissed the increased military activity as “an imitation of imperial might needed to prop up the monumental popularity ratings of the Russian leadership.” He doesn’t think the Kremlin would seriously consider a war with NATO. His main worry is the economic impact of the standoff with the West. “Economically, here in Kaliningrad, we are hostages to our country’s geopolitical endeavors. Foreign investment has practically ceased to flow in,” he said. A Russian ban on food imports from EU countries, imposed in response to Western sanctions over the invasion of Crimea, hit local businesses much harder than European producers. Ginzburg cited 15 small factories, which processed Norwegian salmon, that had to close. On the day Russia introduced its own sanctions, local businesses lost between $40 million and $70 million because the ban stopped them from importing products they had already paid for. Asked about the losses by Kaliningrad’s governor, Nikolay Tsukanov, Russian Prime Minister Dmitry Medvedev said it was “force majeure,” that the Kremlin hadn’t had a choice and the businessmen shouldn’t count on compensation. With fresh memories of large-scale protests that swept Kaliningrad in 2009 and 2010, starting with anger over taxes and broadening to wider economic and political demands, the local authorities are suppressing dissent. Three anti-Putin activists have remained in jail for 14 months for hanging a German flag on the local directorate of the FSB, Russia’s security service and the main successor to the Soviet KGB, in March of last year. Their lawyer, Maria Bontsler, said it was their answer to pro-Russian rebels hoisting Russian flags on government buildings in Ukraine. “They wanted to say that if Russia can claim Crimea, then Germany can just as well claim back Eastern Prussia,” she said. Charged with hooliganism and insulting war veterans, the three face up to seven years in prison. Their trial will resume soon after the Victory Day celebrations.